On June 14, the Cologne office will focus on the “Internet of Things”. Under the motto “Meet. Code. Fun” mgm hosts an exciting hackathon, which challenges not only the coding skills but also the technical talent of the participants. In a first step, an LED traffic light with an Arduino-based environmental sensor including WLAN module will be built. After that the participants will develop software that brings the “Internet of Things” to life by allowing the sensor to communicate with the traffic light. As soon as the WiFi connection is established between the components, the traffic light is supposed to visualize the measurement data of the sensor. Whether temperature, altitude, air pressure, humidity or floor – there are no limits to the creativity of the hackers. And as if this weren’t enough, it will be also possible to use the traffic light to display any status of a website or web service, such as the traffic situation on the way home, possible disturbances on a railway line or the eBay auction status. 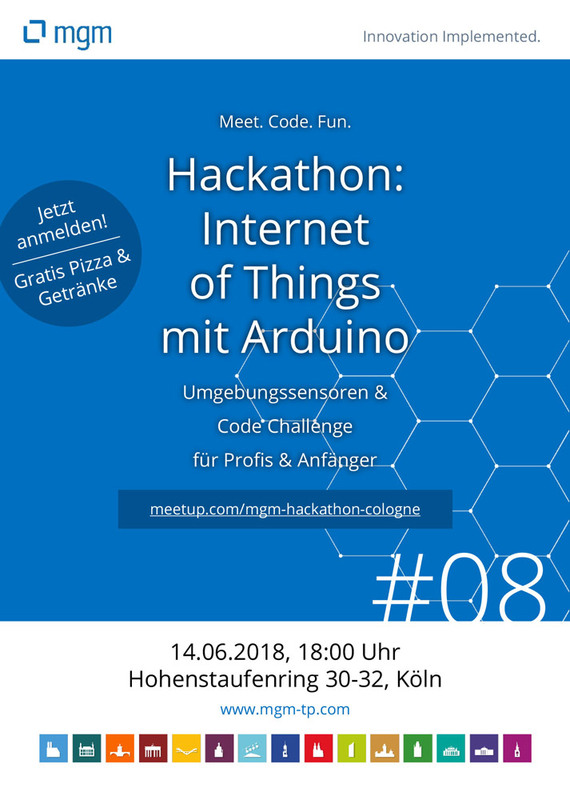 The hackathon will start at 6 pm at the mgm location in Cologne (Hohenstaufenring 30-32). Food and drinks will be provided, of course. Further information can be found here. Visit our Company Website for more information about our services and products!